Agra in Uttar Pradesh, known its wonderful "Taj Mahal", which is the one of the seven wonders of the world. Jaipur is the capital of Rajasthan, known as a "Pink City" of India And Jodhpur is a popular tourist destination in Rajasthan and experience the beautiful foregrounding of a rich cultural legacy against the rugged majesty of the desert locale. In Jodhpur, tourist attractions are the palaces and the forts, which are sentinels of history. Also Jodhpur has a very large handicraft industry which is known all across India. Agra Jaipur Jodhpur tour is the customized tour to fulfill your India vacation dreams. Duration : 8Nights - 9Days with Hotels & travel by Air Conditioned Train & Car with Personal Driver For the below trip. On arrival at Delhi Railway Station, our representative will meet your & transfer you to Hotel OR Airport for your onward Journey. 08 Nights accommodation in Tourist class hotels with privet bathroom & breakfast on twin sharing basis. The rooms are normal European style room with nice soft bed. All arrival, departure, sightseeing's as per above itinerary by Air-condition tourist car in Delhi, Agra, Jaipur, Jodhpur As per the above tour. Train tickets Delhi to Agra, Agra to Jaipur & Jaipur to Jodhpur & Jodhpur to Delhi By air-condition Trains. 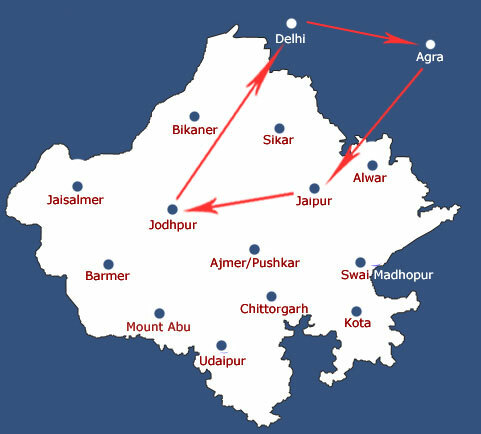 The Guide Service will be Provide in Agra & Jaipur.